This black-and-white real photo postcard1 features a traveler who might be wondering if they have any rooms left at the inn. "Due to political matters in 1883, Isma'il sold the lodge to couple Frederick and Jessie Head as a private residence. The couple came across the building while on their honeymoon and once it was purchased they expanded it. In 1885, it was then sold to an English couple, Ethel and Hugh F. Locke King. 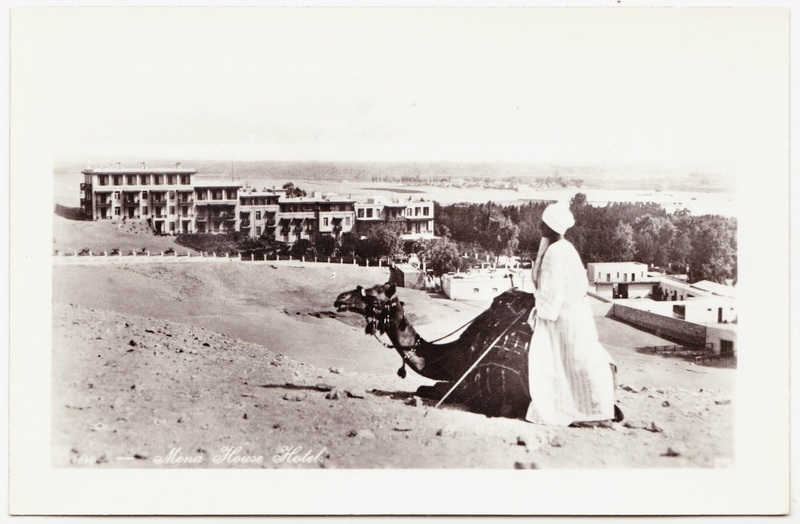 They immediately began construction on the hotel and opened it to the public in 1886 as The Mena House. The hotel is named after the founding father of the first Egyptian dynasty, Mena or King Menes. "In 1890, the hotel opened Egypt’s first swimming pool that same year it was announced that the hotel would remain open year round. During World War I the hotel was requisitioned by Australian troops and occupied again by the Australians in 1939. Toward the end of the war it was then converted to a hospital for wounded Australian troops." Some of the detail offered by the hotel's history page includes how the Locke Kings prepared and decorated the building for its launch as a hotel: "[T]hey retained much of the Arabic ambiance of the facility, and enhanced this with fine Mashrabia (wooden screens) work, fine blue tiles, mosaics and medieval brass-embossed and carved wood doors. Their taste was excellent, and the hotel has been kept with such good care, that many of these original fixtures are still in use." You can also read there about how the hotel has been the site of some important gatherings of world leaders, especially during the 1940s and 1970s. Among those who have used the hotel as a luxury retreat are Arthur Conan Doyle (who spent the winter of 1895-96 there with his wife), Agatha Christie, Charlton Heston and Charlie Chaplin. Today, the Mena House Hotel is fully modernized and offers a spa, fitness center, internet access and other amenities. I don't know, however, if they have a stable for your camel. It does have a 4.5-star rating from TripAdvisor, so if you're going to be in Cairo, need a secure place to stay and have the dough, you probably can't go wrong. 1. This postcard has a purple stamp on the back that states "Pyramids Photo Store & Book Shop" — just like the card I featured back in April. 2. The hotel and Great Pyramid are in Giza, which is part of the Greater Cairo metroplex. 3. Coincidentally, I'm currently reading about a hunting lodge that was build on an asteroid in Clifford D. Simak's 1951 science-fiction novel Time and Again. According to the book, the far-future lodge cost at least a billion dollars, half of which went toward the "atomic plants" necessary to maintain gravity and an atmosphere.